When Sandy was pummeling the East Coast, we in Chicago were warned to stay away from the lake or be in peril of being washed away by giant waves. So great is my need for the water, that I drove to the lake and took videos while being sand-blasted by gale-force winds. The sight of the mighty turbulence left me exhilarated and breathless. I was 14 when I first fell in love with the sea. After a nomadic, land-locked childhood, my family settled near Dallas, Texas and our first vacation was Galveston Island—300 miles south, on the Gulf of Mexico. The crashing surf was my soundtrack as I walked the beach, collecting shells and sand dollars, or sat staring toward the horizon, mesmerized by the rhythm of the rolling waves. I could sit for hours, losing track of time, lost in thought. When I moved to Chicago, 30 years ago, my only requirement was living close to the lake. Although winter has not yet descended with its usual fury, temperatures have dropped and the legendary Chicago wind is biting and cold. One recent attempt at a walk on the beach had me scurrying back to my car after just a few freezing steps. And I have been swept up by the demands of the holiday season. Lately I’ve taken pride in being efficient, asking myself, “What is the best use of this block of time?” Work has seemed the answer—paperwork, balancing bank statements, paying bills, cleaning, returning phone calls and emails, writing, thinking about (but not doing!) Christmas shopping, even exercising has been rigidly scheduled into my weekly routine. Still, the water calls. Do I take time away from what seems most urgent? Last Sunday I took a walk to the beach. Although there were patches of ice in the sand, the sky was blue and the sun was bright and warm on my face. 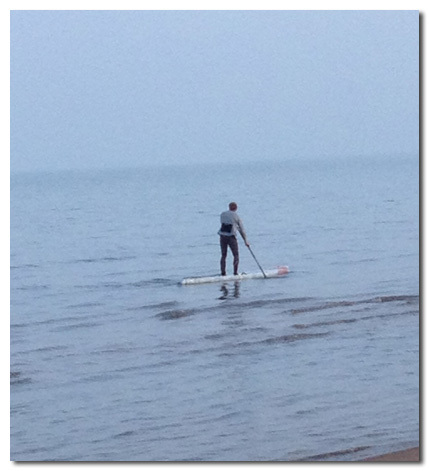 As I sat on my stone, I watched a man on a stand-up paddleboard zigzagging through the water, parallel to the shoreline. Bent over, he dug his paddle into the water on one side, then the other, then the other—then he stood tall, balancing on the board as it glided for a few moments. Paddle, paddle, paddle—glide. Paddle, paddle, paddle—glide. What he was doing takes the utmost concentration and strength. I remember from an ill-fated attempt at windsurfing years ago—muscles in my arms, shoulders, back, and legs burning with the exertion of holding on and staying upright. There weren’t crashing waves on Sunday, but there was wind on the water. The man was clearly working hard for his brief glides. Just watching was exhausting—and mesmerizing. It was exercise and hard work for the briefest moments of aaahhh. Paddle, paddle, paddle—aaahhh. Paddle, paddle, paddle—aaahhh. Suddenly, I was reminded of what I teach—balance is the key to healthy lives. Balance between mind, body, and spirit—but also work, play, and doing that which soothes our souls. Taking the time in such a way that allows us to be absorbed in the moment, rather than relentlessly driving through one task just so we can go on to the next. Balance does require work, but also requires rest. Sunday, the sound of the water quieted my mind and soothed my soul. I returned home with a different kind of peacefulness—reminded why I need the water—knowing that in the midst of work sometimes the best use of my time is to simply take time to breathe. Paddle, paddle, paddle—stand tall, breathe, and enjoy the glide.